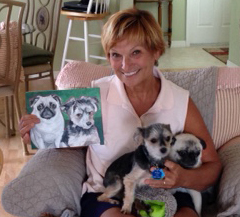 Custom-painted pet portraits by a life-long artist and animal lover. I made my career as a middle school art teacher, never saying that I was going to work, I was going to school. Going to school each day was another opportunity to share my love of art with lively and engaging kids. When I retired, I became a volunteer at our community shelter, and eventually became the shelter's volunteer coordinator. Now I am back to being one of the volunteers and continue to lend my support by donating pet portraits for fund raisers and raffles. Meeting the subjects, Sassy & Benji. I got human hugs and doggie kisses when I delivered the painting. Here I am with one of our shelter dogs just before he went to his forever home. I enjoy getting to know each pet as I paint their portrait from a photo supplied by the owner. "Cathy's paintings are truly remarkable and I believe it is because she has such deep compassion for animals. ... she is able to see our pets the way we see them and all the things that make them dear to our hearts. " 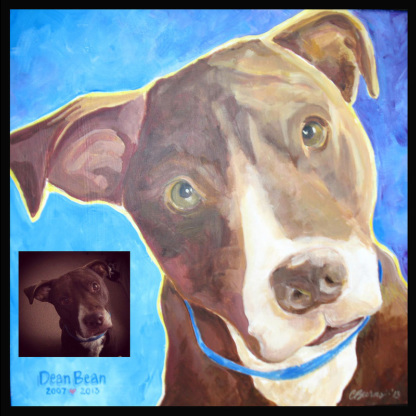 My pet portraits began with a shelter dog named Dean. He was diagnosed with kidney failure after his adoption and was returned to the shelter. During his final months, Dean was given loving foster care in the home of a volunteer until he passed away. 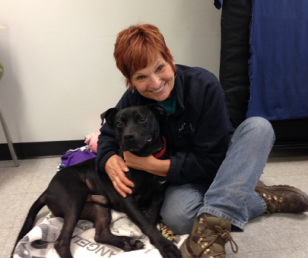 Shelter staff and volunteers were deeply saddened by Dean's struggles and his death, especially his care giver. While Dean was in his final days, I painted his portrait from a Facebook photo to give to the wonderful volunteer who loved Dean so much. As an artist, I am always creating something. I have been doing commissioned work for my entire adult life: signs, logo design, murals, poster & flyer layouts, paintings, and drawings. I have done several painted furniture items for myself as well as commissioned pieces.